By lustre I mean reduced pigment or clay paste lustre. Commonly called “Arabian”, “Persian”, or even “smoked lustre”, its origins can be traced to the Middle East and the 9th century AD. It is thought that the technology had developed from glass workers who had discovered that metal oxides could be used to stain glass. 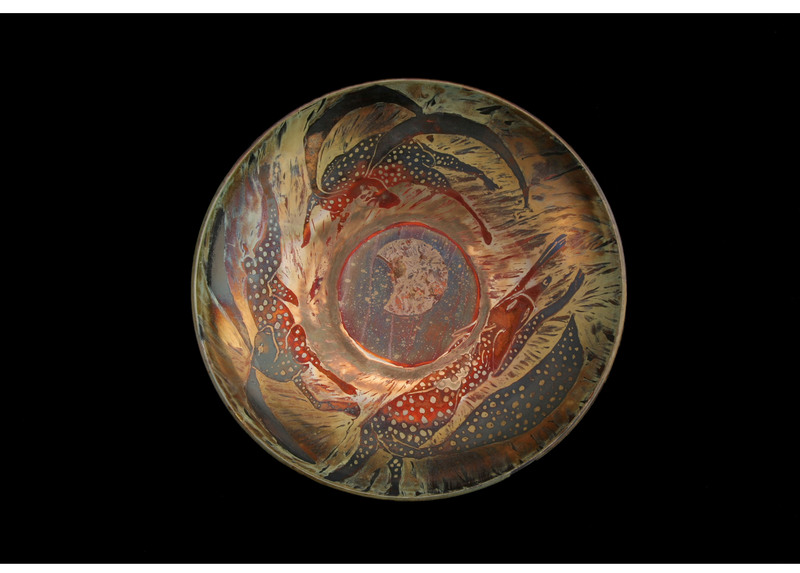 The alkaline and lead based glazes in use at the time in the Middle East were receptive to the formation of lustre. As an expressive medium lustre has defied large scale production methods. There are good reasons why this is so. 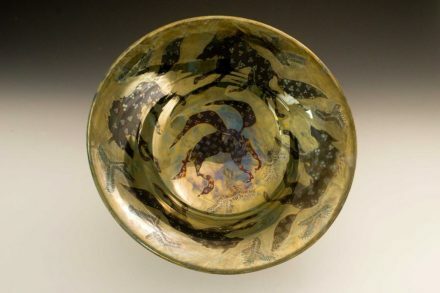 After the pottery has been made and glazed in a conventional way, it must then be subjected to an additional firing that carries a great risk of failure. Cipriano Piccolpasso statement that “oft times of 100 pieces of ware tried in the fire, scarce 6 are good” remains as true today as when the statement was made 500 years ago. It might be useful to explain the practical side of lustre firing for those interested in exploring the technique. 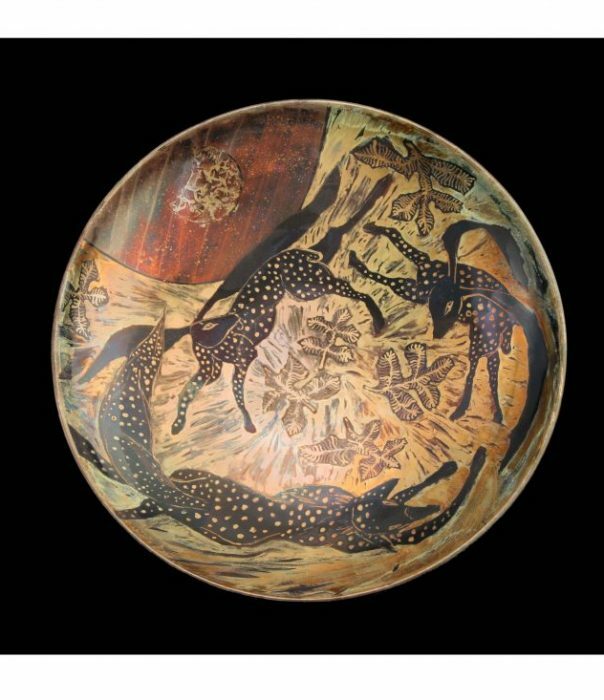 The already glazed and fired pottery is painted with a clay paste pigment and subjected to the right temperature, degree of reduction and duration of firing in this third and most critical firing (the lustre firing). 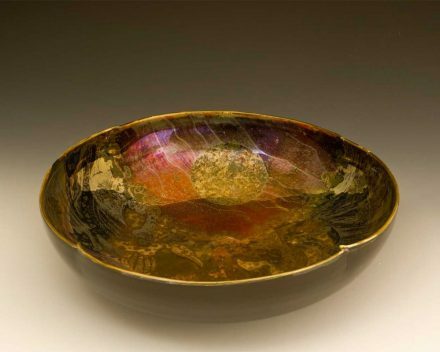 Between 550 to 650 degrees C the glaze softens and has become receptive to the formation of lustre. A dull red glow is now visible in the kiln and well before the discovery of heat measuring equipment, the temperature was determined by eye and firing experience. The ions in the glaze and pigment are now excited and energised by the firing temperature. The kilns atmosphere is reduced and the ions begin to exchange and migrate into the glaze structure. The ceramic term “reduction” means that oxygen entering the kiln is cut back (reduced) and is a simple thing to do by closing down the chimney damper. The reduction cycles will vary according to the kiln used for the firing and its size. In a traditional updraft wood kiln in use both by the Islamic world and later during the Renaissance in Italy, a small number of reduction cycles were used (as little as perhaps 2 or 3) whilst in a modern day downdraft wood kiln it maybe upwards of 9 or so reduction cycles. The formation of a red lustre (based on copper salts) favours slightly higher temperatures and a longer reduction cycle. Visible in the illustration from the Piccolpasso manuscript is the sand timer as the kiln firer regulates the cycles and the duration of the firing. The only true governing factor in determine the correct number of firing cycles is that the firing should end as soon as the lustre colour sought has formed, determined by examining draw trials removed after each reduction cycle.The total duration of these reduction cycles is rarely longer than an hour or so as the lustre pigment is slowly being volatilised away. 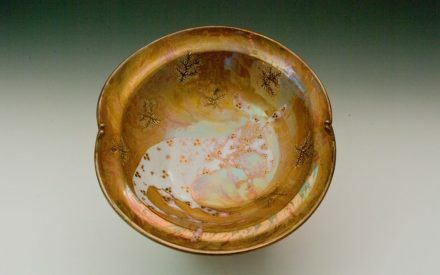 Too low a temperature (the glaze has not softened sufficiently) and the clay pigment is easily brushed away to show that no lustre has formed underneath the pigment crust; too high a temperature, or too strong a reduction cycle or a reduction cycle that is too long in duration and the work is ruined as the clay pigment carrier fuses into the glaze and cannot be removed or the pigment has over-fired and darkened. 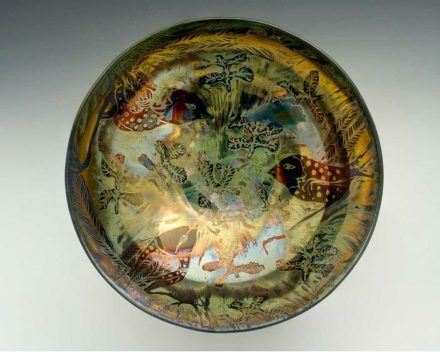 There is a small window of opportunity when the glaze and pigment (after heating to the right temperature) become receptive and a film of lustre is able to be deposited into the glaze. 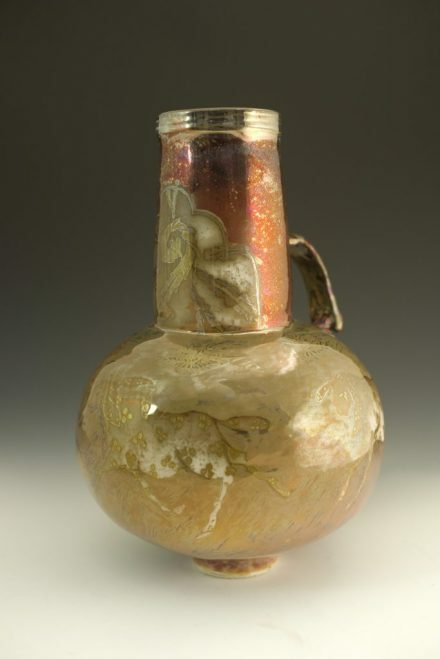 This type of lustre differs from resinate lustre (an 18th century invention and nowadays the most common form of lustre used on ceramics) where the film of metal is deposited onto the glaze and so is easily abraded by wear. Analysis by electron microscope reveal that lustre forms at a nano level with the transference of ions from the metal oxide pigment into the receptive glaze. The metal oxide on this nano scale is laid down in layers with each reduction cycle, and as light passes through these layers, interference and the refraction of light occurs as it is reflected back through these layers producing the iridescence colours we see in a rainbow. And just as with a rainbow, the colours appear to change as the viewing angle is changed. 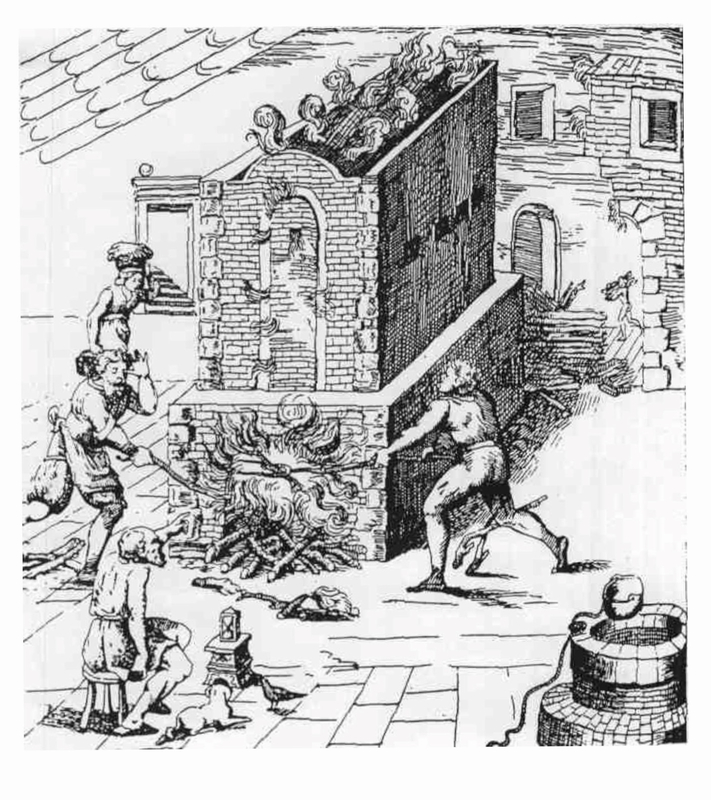 To be present at a lustre firing, when the exit for the flame is closed shut (almost), one sees smoke seeping out of every crack in the kiln, changing from black to white to acrid yellow as the oxygen is stolen from inside the kiln by the reducing atmosphere (see the illustration from Piccolpasso’s manuscript). The kilns draught is slowed further and if one peers inside, smoke is seen to flow under and over, hovering over depressions of the painted pottery before finally exiting wherever it can from the kiln. 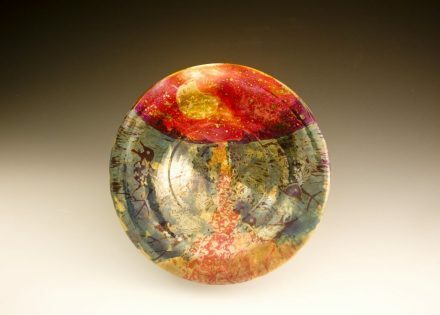 It is in these quiet areas of the kiln that the most interesting of colours and iridescence develop. Lustre making can rightly be described as painting with smoke. I think of the journey of lustre as a living tradition, that like a river, may ebb and flow, sometimes seemingly to disappear only to re-appear at some far distant point, but carried ever forward by some unseen force. These forces are creativity and imagination. For when they stall, like a river when its waters begin to slow and stagnate, it awaits the right circumstances to arise again to burst its restrictions and like that river, begin to flow once more. Lustres origins can be traced to the Islamic world in the 9th century, its knowledge passing from region to region , moving from the Middle East into Europe through Al-Andalus (modern day southern Spain) and even into Renaissance Italy. Lost and then seemingly “re-discovered” elsewhere time and time again. This “re-discovery” of course, has at its core, not only the transmission of past knowledge, processes (or in some cases the migration of potters escaping turmoil or persecution), but also the grafting of native creativity and experimentation, keeping the tradition alive and producing another flowering of imagination. What mattered then was not so much the handing down of a formula or a glaze recipe, but how the knowledge was used and this remains as true today as in the past.